Concrete, brick and block in 8 inches or less pieces or sections that are free of any contamination (metal, wire, rebar, tar or any other substance) can be recycled at ACUA. Material must be separated from all other waste types so it can be taken out of the waste stream and recycled. All loads of concrete, brick and block will be weighed at the scalehouse and then will be directed to the transfer station for inspection and off-loading. After the load has been inspected and certified to be clean and free of contamination the load will be charge at the rate. If not clean or if mixed with other material, it will be considered Construction and Demolition Debris. 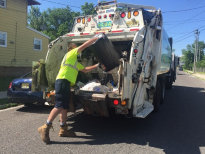 To see disposal rates and procedures, click here.